Please welcome Vonnie Winslow Crist to the Far Edge of Normal! 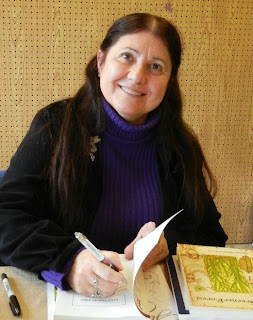 Born in the Year of the Dragon, Vonnie Winslow Crist has had a life-long interest in reading, writing, art, myth, fairytales, folklore, and legends. And having been a night person since infancy, she is quite fond of stars, moonlight, forests, owls, and other creatures of the darkness. After attending Perry Hall Elementary, Parkville Junior High, and Perry Hall High, she earned a Bachelor of Science degree in Art Education from Towson University. She married, then raised three children, did freelance illustrating and writing, and taught poetry for the Maryland State Arts Council’s Artists in Education Program. Thirty years after graduating from Towson, she returned to her alma mater and earned a Masters in Professional Writing. 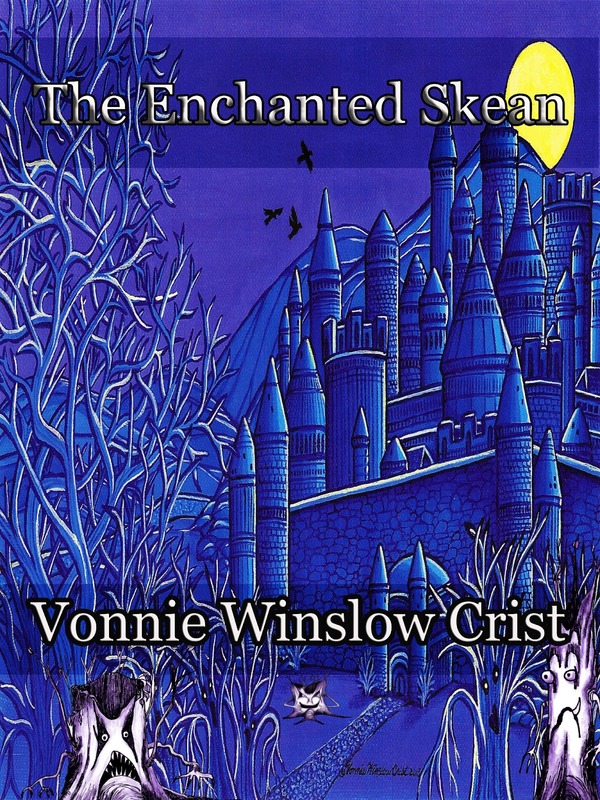 A firm believer that the world around us is filled with miracles, mystery, and magic, Vonnie still sees fairies amidst the trees, mermaids on jetties, and ghosts and goblins of all sorts in the shadows. Her garden overflows with herbs and statues of animals. Toadstool rings sprout regularly on her lawn. And she's found so many four-leafed clovers that she keeps them in a jar. For more information, check her website or blog. Find her books on Amazon, Barnes and Noble, and elsewhere. Become her friend and fan on Facebook and Goodreads. And follow her on Twitter. I prefer to write fantasy with a mythic or folklore feel to it. I've loved myths, legends, folklore, and fairytales since I was little, so my writing tends to be influenced by them. My favorite book or story is the one I'm working on at the moment or the one I'm dreaming about writing next. That being said, if I had to choose a favorite published story, I guess it would be either “Blood of the Swan” or “Sideshow by the Sea.” Both won Honorable Mentions in L. Ron Hubbard's Writers of the Future Contests, were published by wonderful semi-pro presses, and ended up in one of my short story collections. Both tales are also filled with folklore and mythic creatures. 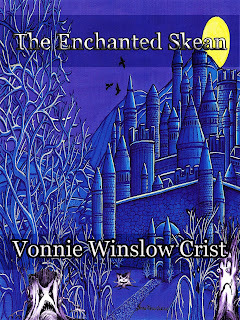 As far as new publications, my Young Adult fantasy, “The Enchanted Skean,” was just published by Mockingbird Lane Press. You can view its book trailer here. My second collection of speculative short stories (with a pinch of poetry and art tossed in for good measure), “Owl Light,” is due out shortly from Cold Moon Press. One of my paintings is due to be featured on the cover of “Bards and Sages Quarterly,” a dark fantasy poem should be in the next issue of “Paper Crow” magazine, and I'm hoping a couple of stories make it into anthologies due out later this year. Oddly, I rarely write to music, though I listen to music when I'm painting. I like to listen to Stevie Nicks, Enya, assorted Celtic music, Heart, the Eagles, Meatloaf, the Dixie Chicks... As you can see, it's a rather eclectic mix. When I'm writing, I like to listen to nature – the sound of birds, the wind, the buzzing of insects, sleet clicking against the window, etc. I've only had one cat, Samantha, a stray that wandered into my life and heart. But I've had many dogs (all of them strays or unwanted animals) since I was a toddler. Currently, my dog is Sandy the Black-Mouthed Cur (the same breed as Old Yeller). I adopted her from the Humane Society, and she keeps me company when I'm writing. As far as writers' organizations, I recommend Broad Universe for speculative writers, the Society of Children's Book Writers and Illustrators for children's and young adult writers, and then, a local writers' group that is professional and positive for general writing support. In my case, it's the Maryland Writers Association. As far as writing advice: Read, write, read, write, then rewrite. Find a helpful critique group. Research markets, submit work, and keep writing while you wait to hear back from editors. Don't be discouraged. Practice makes you better. Persistence will usually result is finally getting an acceptance letter. And always be polite and professional to editors, fellow writers, and readers. As a book-lover since childhood, I've been inspired by many authors. A few who come to mind are JRR Tolkien, CS Lewis, Andre Norton, Laura Ingalls Wilder, and Ruth Gannet Stiles. I'll be at Balticon on Memorial Day Weekend and I'll be speaking to several Maryland writers' groups in the next few months. There are many moments in history I'd love to witness, but I must admit to liking modern day food, housing, education, medical care, and the equal rights women enjoy in the USA – so I guess I'll have to take a pass on going back in time except in books. Voland, Glum, and Elke – Janepar warriors from “The Enchanted Skean.” There would be singing, tale-telling, abundant food and drink, and good humor. I'd serve a hearty stew, fresh-baked bread, and blueberry pie. On earth, if it were safe to do so, I'd like to visit the remains of ancient societies in Europe, the Middle East, along the Mediterranean, in Central and South America, Asia, etc. (My interest in history is showing here). Though I'd love to explore a planet suitable for humans, it would be outside our solar system, and therefore if I journeyed to it, I'd have to give up years with my family here on earth. And, alas, I'm not willing to do that. Black. I know it seems grim, but I think it's because black reminds me of night. Black also makes you look slimmer, right? *cheesy grin* Thanks for visiting, Vonnie. It's been a pleasure! Thanks for having me, Jaleta. It seems every time I do an interview, I learn something about myself! I'm so sorry I missed your comment earlier. I've got anti-spamming missiles loaded on here, and sometimes the real comments get neglected. I enjoyed the interview, Vonnie! Poisoned Pawn Release Date This Week!